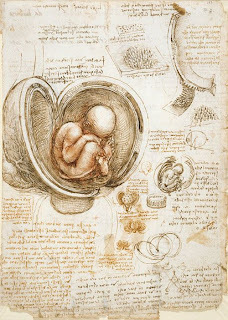 Drawings such as The Fetus and Lining of the Uterus (c. 1511-1513, shown above) are important today because they established a precendent for scientific illustration, particularly with Leonardo’s use of cutaway views. I think this is such an interesting interpretation of Leonardo’s backwards writing. As far as I know, this is the only article that offers an art historical interpretation of these strange annotations. Does anyone know of any other articles? What do you think of Leonardo’s sketches and backwards writing? Do you like Holly’s interpretation? 1 Martin Kemp. “Leonardo da Vinci.” In Grove Art Online. Oxford Art Online, http://www.oxfordartonline.com.erl.lib.byu.edu/subscriber/article/grove/art/T050401, accessed February 28, 2009). 2 Michael Ann Holly, “Writing Leonardo Backwards,” New Literary History 23, no. 1 (Winter, 1992): 175. It should be noted that this article actually is not about Leonardo; Holly uses Leonardo as an allegory for discussing historical consciousness in the late 20th century. I’ve been thinking a lot lately about if art should be displayed and conserved to follow the “artist’s original intent.” The phrase “original intent” is used a lot by conservators, specifically in terms of describing how the conservator aims to preserve and restore exactly what the artist originally created. However, Steven W. Dykstra argues in his article The Artist’s Intentions and the Intentional Fallacy in Fine Arts Conservation (found online here) that this term is ambiguous. There are several different definitions of the word “intent.” For example, the original intent of the artist could refer to the artist’s aims for a work of art, or it could refer to the artistic outcome (which may or may not be the original artistic aim). In addition, “intent” could refer to biographical motives – the artist could be seeking fame, emotional catharsis, or the satisfaction of patrons by creating a work of art.1 Often, we don’t even know what any of the possible intents of the artist may have been. I guess I’m thinking a lot about this lately because of my last post, where I complained that reproductions of Monet’s water lily paintings are used as decoration in college girls’ bathrooms. I still think that’s inappropriate; I would never do it. But now I’m starting to wonder what Monet’s specific “intent” may have been. 1 Steven W. Dykstra, “The Artist’s Intentions and the Intentional Fallacy in Fine Arts Conservation,” Journal of the American Institute for Conservation 35, no. 3 (Autumn-Winter 1996) : 205. 3 Ernst Gombrich, “Dark Varnishes, Variations on a Theme from Pliny,” The Burlington Magazine 104 (1962): 54. 4 Sarah Walden, The Ravished Image, (New York: St. Martin’s Press, 1985), 118. This book specifically deals with the Gombrich and Ruhemann debate. The complexity and diversity of art in the 19th century parallels the complex changes which occurred during the rise of modernism, particularly the changes which came about because of industrialization and urbanization. It is no wonder that there is some confusion regarding all of the art movements in 19th century France – particularly Impressionism and Post-Impressionism. Both of these artistic movements have rather nebulous and shifting definitions. I thought that I would jot down some of the goals and aims of Impressionism today, and later do the same for Post-Impressionism in another blog entry. Essentially, Impressionism is a painting movement which focuses on capturing a single moment in time. In some ways, it was influenced by the Realism and the invention of the camera; realist painters strove to capture a moment in time, but Impressionists took that aim a step further by depicting a split second in time. This split second effect is heightened on the canvas by the use of loose brushstrokes; they require speed and spontaneity in execution. 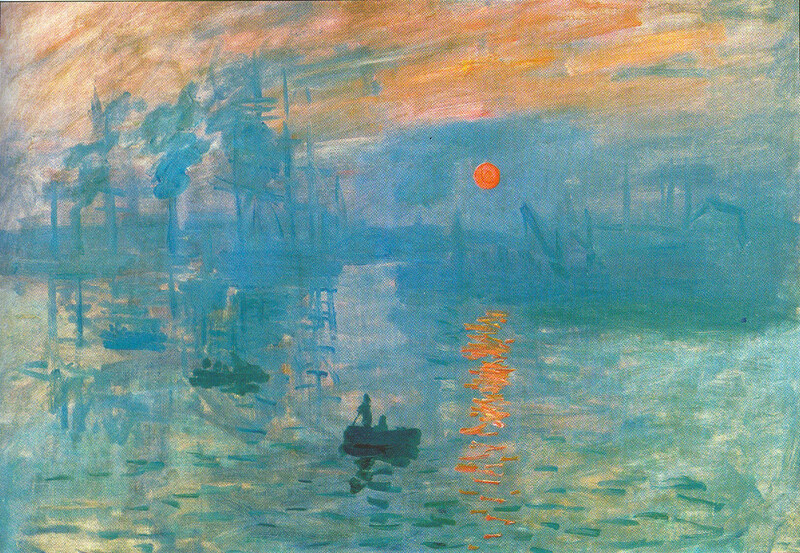 An example of loose brushstrokes can be seen in the water of Monet’s painting Impression: Sunrise (1872, shown above to the right). Impressionists were also interested in the effects of light and color, particularly how the eye could blend different colors together to create optically accurate depictions. This interest in light and color also accounts for the interest in outdoor subject matter. Furthermore, the invention of oil paint in tubes also allowed the Impressionists to go outdoors and paint – they were no longer required to work expressly inside their studios. Since artists at this time were painting outside, we have a fairly good idea of what early urbanization and industrialization in Paris looked like at the time. In my opinion, there are only two painters which can truly be labeled as impressionists: Monet and Renoir. Really, the only reason for this is because Monet and Renoir were the ones who spearheaded the artistic movement. And (in the opinion of one of my past teachers) Monet is the only one who can be considered a “good” impressionist. I kind of have to agree – Renoir is too interested in painting people and figures (see The Luncheon of the Boating Party (c. 1880) as an example), and this detracts from fulfilling the Impressionistic aims of capturing light and color. Personally, I also don’t think that Renoir was that fabulous of a painter. I think some of his figures are awkward and the colors with which he experiments aren’t that becoming or beautiful. 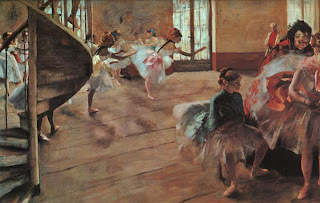 Degas (I love how the painting Ballet Rehearsal (1874, shown above) captures a split second of a ballet class, and I particularly like how it mimics a quickly-snapped photograph with the cropped figures on the right). I guess what I’m trying to say is, if you have ever been confused about Impressionism and Impressionistic artists before, don’t feel too bad. In some ways, the movement is a nebulous umbrella for paintings and artists that are kinda-sorta similar. 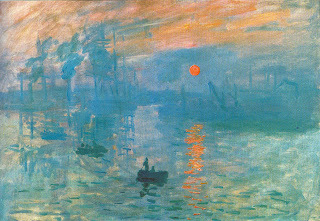 In fact, participation in the Impressionism shows was constantly a source of contention and debate among artists at the time.1 If you ever wonder if an artist is an Impressionist, find out if the artist is a) French, b) exhibited between the 1860s and 1880s), c) uses loose brushstrokes, or d) is interested in light or outdoor subject matter. If the artist falls into at least two of those categories, then there is a good chance that you can call the artist an Impressionist. I like Impressionism alright. There are some beautiful colors and interesting optical effects that can be found in this period. And I really love the idea of capturing a split second on a canvas. The thing that really bothers me about Impressionism is that it has become very trendy, almost kitsch. It bothers me that so many Impressionist works now decorate handbags, umbrellas, mugs, scarves, and pencils. And it seems like every college girl has a copy of one of Monet’s water lily paintings in her bathroom. This is just my opinion, of course, but I doubt that Monet would be pleased to find out that he’s a trendy bathroom decorator. What Impressionist paintings do you like? Do you like Impressionism? Do you think Impressionism is kinda kitschy? 1 Fred S. Kleiner and Christin J. Mamiya, Gardner’s Art Through the Ages, vol. 12 (Belmont, CA: Wadsworth, 2005), 869. This month marks the one year anniversary of my thesis defense. I think I will always associate Leap Year Day as the day I became a Master of Arts. I can’t believe that a whole year has passed; sometimes I think that I haven’t done enough with my degree. I really loved working on my thesis. I was lucky to receive a grant which enabled me to travel to Brazil and do research and analysis on-site. My thesis was about an 18th century Brazilian sculptor named Aleijadinho (a nickname which means “The Little Cripple”) who lived during a time of political unrest in Brazil. I argued that Aleijadinho’s sculptures of twelve Old Testament prophets (located at the church Bom Jesus dos Matozinhos) reflect this political unrest because they are positioned in the movements and formations of capoeira, an Afro-Brazilian martial art. Capoeira is inherently political because it probably developed as a way for African slaves to fight their way off of plantations. Therefore, I interpreted these statues as a type of political propaganda; through the representation of capoeira, I find that these statues exhibit a call for liberation for not only African slaves, but also Brazilian colonists (who were under Portuguese rule at the time). Chapter one of my thesis discusses the political unrest that occurred in Brazil during the lifetime of Aleijadinho. It also discusses how Aleijadinho may have been associated with the rebel group, the Inconfidência Mineira. This group formed in Aleijadinho’s hometown and tried to overthrow the Portuguese crown. Chapter two deals with the history of capoeira and its political associations. Chapter three contains my analysis of the Prophets – I look at specific capoeira movements and compare them to different statues. I also compare capoeira formations with the formation of and interplay between the Prophets statues. The chapter also contains an analysis of how the signifiers of capoeira (as found on the statues) can be interpreted as political propaganda. Phew – it was hard to type those last two paragraphs. I guess I haven’t had a lot of practice explaining my thesis lately! If you want to read an abstract of my thesis (it contains more details than what I typed above), click here. Or, if you want to read my thesis (or look at the pictures of the statues! ), it has been published online here. It’s quite a lot of reading, though. I won’t be offended if you just want to peruse. I just imported all of my art history posts onto this site today. 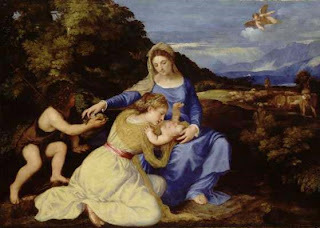 My previous blog contained a lot of other miscellaneous thoughts and pictures intermixed with my art history posts, and I have debated for a long time whether I should keep the two paradigms separate. Reading this article helped solidify my decision to create a separate art history blog. Although I don’t pretend to be a “great art history blogger” (isn’t that title a great play off of Nochlin’s article “Why Have There Been No Great Women Artists?”), I hope that I can make a contribution to art history through blogging. More than anything, this blog is a great way for me to write down my research and thoughts. Hopefully I will be able to reach my target audience of art historians and art lovers with a blog that specifically focuses on art. It would be really fun to build up a strong community of art historian bloggers.